A Fuerteventura chimpanzee that featured in the headlines when she survived being shot by police after escaping with two others from a compound in a zoo on the island is back in the news. 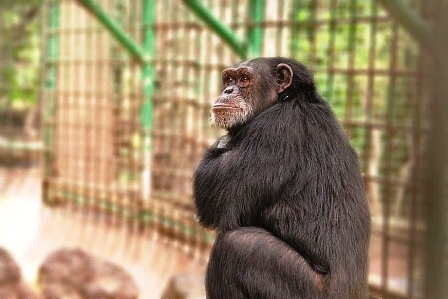 04.12.2015 - The Oasis Park zoo has decided to move Chita the chimp to a new home on the mainland after 28 years. Now aged 30, the female primate was allowed to leave in order to be with other chimps at a facility in Girona in northeast Spain. The Park’s owners decided to act after realising that the loss of her two colleagues, which were shot dead on June 26 after rampaging through the zoo and injuring a keeper, was proving detrimental to Chita’s welfare. They contacted a number of rescue centres before opting for the Mona Foundation, where the highly sociable Chita will hopefully form a new family to spend the rest of her days with. The chimp needed extensive surgery after the June shooting and had to undergo rigorous veterinary checks to ensure that she was strong enough to fly to Madrid and then on to Girona. She will spend several weeks acclimatising in her new surroundings before being introduced gradually to the other chimps at the Foundation. Zoo sources say she could live for up to another 30 years in her new home. Produced with news.CMS in 0,0697 seconds.